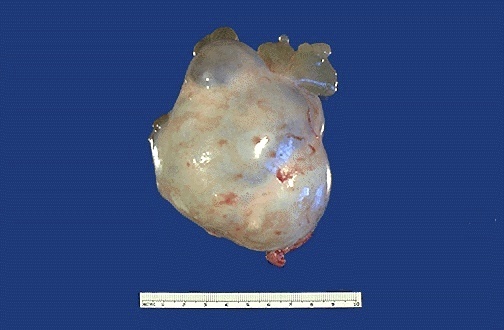 This is a tumor of ovarian surface epithelium. These are the most common ovarian neoplasms. Such neoplasms may be lined by epithelium that is serous or mucinous. Pictured here is a serous cystadenoma. It was filled with pale yellow serous fluid in only a single cavity. Mucinous tumors are filled with sticky mucin and tend to be multiloculated. Benign epithelial ovarian tumors are bilateral in about 20% of cases.